I could list a countless number of things that people typically take one look at and dismiss, simply because they don't understand it, nor take the time to do so. With touted order flows, this statement is very much true. In Forex, they're one of few things we have in terms of transparency, so of course some emphasis needs to be in place. I will say right out of the gate that many of my own initial interpretations were essentially busted through a period of long and drawn out observation, taking 1/2 hour every day to see the language accompanying these levels and how price reacted when they were actually hit. What you'll read below is a recap of my findings. I found that for currency pairs having higher liquidity (eg EUR/USD), things generally get a bit more convoluted, and I find myself resorting to more reversal confirmation tactics vs. direct top and bottom picking. To gauge liquidity, please refer to this presentation I posted several months back (slide 7). This mainly includes looking for topping or bottoming structures, such as triple taps, and then trading a diverged trendline break or pullback to 61.8 or 76% of the initial retracement (price bottom to first pullback after hitting the level). I favored stops and option barriers for reversals, and trading the top of order blocks for fades and when they broke, continuation. The longest-running currency fades occurred at times of day where reversals are common (NY open, very beginning of London, London close). The longest-running momentum plays (where ranges of demand or offers mentioned, and were violated) happened every other time. I found myself favoring trades on EUR/JPY, AUD/USD and USD/JPY after a while, moreso than EUR/USD. The levels I found myself staying away from the most were simple areas where bids or offers were touted in a range (eg Offers 1.2530-1.2535). Order flows are not “golden keys to the vault”. You still have to manage the trade properly and be patient, of course, in terms of getting in the market and while your position matriculates. If you are a subscriber to lazy or sloppy trading than really nothing will help you until you fix that issue first. Price action, like the type described above, is not only enormously helpful, but required in order to understand what is happening and when. No handouts and don't take anything for granted. Below is a list of my findings, as they are stated, word for word. Today, we're not getting into a discussion of why any of this is happening, and for now it really shouldn't matter. Much of it would be theoretical anyway, and theory and practice are two different things. Theory is for higher education and guys trying to act like big shots. Practice is for making money. 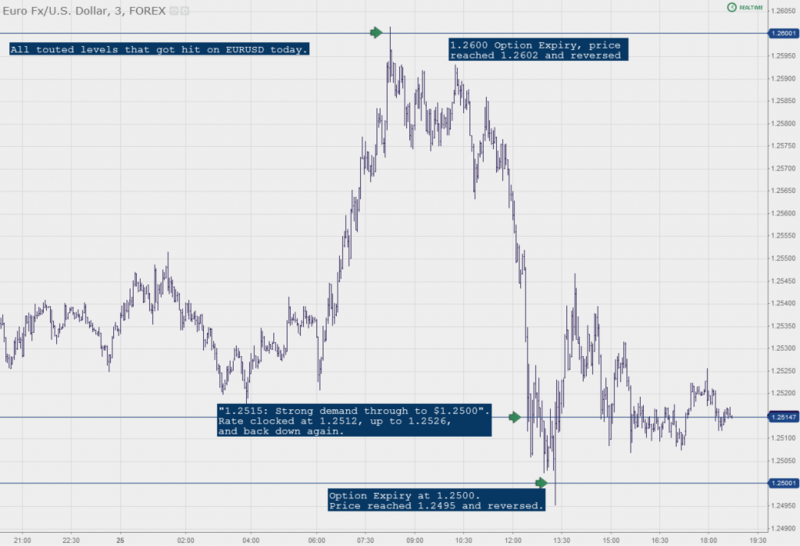 Stops (one price provided eg “Stops 1.2720” : Indicate reversal on the FIRST HIT (very important). When “stops” are resting on their own, with no other flows in the area, these were by far the most reliable in terms of reversal. The average price descent or ascent beyond the touted level was only 4 pips (to take in the ask/bid) before it reversed. When price meandered directly above or below the level for some time, the exact opposite occurred, and price raced forward. On the SECOND hit, price raced forward. Large stops: These are rare and don't come around too often, and I still feel as though I need more time looking into them. From what I saw, however, drawdown was slightly deeper than just “stops” being stated (around 5-10 pips) before a first-time hit reversal. And just as above, the second thrust blew the level wide open. Bids (or offers) ahead of a level, stops below (or above): Same as above, reversal, although the average price descent or ascent beyond the touted level was greater than just stops resting on their own (anywhere from 8 to as much as 25 pips in rare circumstances). EUR/USD showed the most drawdown with these. Bids (or offers) at the same level as stops (one price provided): Same again, reversal. Drawdown with these was very small, once again. Anywhere from 2-5 pips. Option barrier: Like stops resting on their own, these also proved to be good reversal points when no other flows were mentioned in the area. Price passed the level by appx 5 pips (taking it out) before reversing. Medium / Strong Offers or Demand (range provided eg Medium Offers 1.2520-15): These vary quite a bit. Price is entering a massive range of pending order flow while fighting intraday spot orders and the typical scenario that occurs is the following: price hits the top of the order block and pulls back roughly 10-12 pips, and then either 1. goes back into the order block, taking it out, or 2. maintains the reversal momentum. Full blown reversals usually occurred at the normal times of day for this type of activity, where price registers daily highs and lows. I found that once the base of the order block was violated, price took it out completely and used the bottom of it as support or resistance and kept moving forward. Additionally, if there were more compelling targets shortly ahead, you tend to find these violated (either stops or option barriers). Ultimately, these blocks can vary quite a bit in context and from pair to pair. Towards the end of trading sessions or at fixing events, they tend to fade the best, but trading into them at the right moments showed profitable outcomes as well (after stops triggered, etc.). Option Barrier, Bids or offers on approach, stops (one price provided): reversal once again, though I witnessed the drawdown range vary from -3 to -10 pips. Demand from Japanese importers (JPY Only, one price provided): drawdown of appx. 5-10 pips before reversal. Image: All touted flows that got hit today on EUR/USD. Thanks for the article. How do you know where these option stops/barriers are? There are really only a few that I know of right now. The first is Reuters Eikon, where you have access to their listings as well as IFR Markets (which is also owned by Reuters). To get them, just filter a search for “includes=offers, bids, demand, etc. or IFR”. The second is Market News International’s FX bullets, which will run you close to 300 a month, and are probably the most robust. The guys at ForexLive also post them from time to time, so you might want to ask them their sources as well. I’ve never had contact with those guys so unfortunately can’t help you out there, but I think it’s Reuters that they’re using. The third is Bloomberg, and there’s not much listed at all, and you have to dig for it by doing a similar search scenario as with Reuters. If you are not prepared to pay for a service such as Reuters or MNI, I seriously suggest forexLive. 99.9% of the forex sites out there are in my opinion BS and likely set-up by dealers to sucker retail into giving up their money. I love NBT even though I admit that I do not understand most of what Steve shares, I’m learning and certainly am a far way forward from where I was when I first began trying to learn this market. My best (rookie) advice to you? 1) DO NOT OVER TRADE. 2) Manage your position size. Meaning allow room for significant error and prepare to be patient. It is NOT a casino and if you are treating it as such you will lose. 3) Do not use stops. If you do they will be tapped. If you need a stop, you should not have entered the trade. “3) do not use stops. If you need a stop, you should not have entered the trade”…probably the worst advice for a newbie to read, ever. I can’t believe anyone would actually give that advice. I strongly urge anyone reading this to ignore that last remark. Money management, including properly set stops, is very important and just smart trading. http://www.talking-forex.com touts these option barriers for the 10AM NY cut and also the London cut. I find this to be enough. You could also look up the CME futures options information as the barriers there are often eye balled by spot fx players as well. Prices do move in unison. Just personal observations though, Steve correct me if I am mispeaking. In all the options barriers also do have a “magnet like” effect to them. Very useful distinctions there Steve, I have until now just lumped all these together. Thanks for sharing. Great article and site, I am late to the party, only finding NBT by hearing about BRV on FF. I hope this is not off topic but have you any experience/comment with OrderBookFX? I am reading through all the pages on this site and have searched but don’t see anything hence this post. Hey Bill, Yes, you’re not the first one asking about this service. I’ve looked it up in the past, and it appears what they do is simply aggregate and create a redundant feed of common ECN platforms. These platforms, like FXAll, allows for viewing order size information, should the trader choose to divulge it. I have quite a bit of experience working with these platforms now. Pretty much all of these now have the ability to “hide” trades. So while the pictures not complete, it is definitely more depth than what most are used to. Essentially you treat the orders placed through systems like these just as you would retail orders. For example, if price is in a downtrend, and a retracement occurs, you essentially wait until price traverses upward and eliminates all resting orders to sell prior to your own entry. Retail traders chase trends. When retracements occur, they tend to be much more severe than the retail (and bulk of “institutional” traders placing these orders) anticipate. Using order flow on a platform like this gives you intra day depth in terms of the severity of these orders. Regardless, you still need alternative, usually technical, forms of entry. There are zero golden keys in this business. That being said, it is still only one part of the equation, not to mention these sources remain anonymous, for obvious reasons through the service. The giveaway here is that you don’t know exactly what you are leaping into. The best use of a platform like this, in my experience and opinion, Is as mentioned above. Price tends not to reverse until these orders are executed on an intraday basis.